The Steam is required for the game installation. This is a game distribution platform, many video games are sold and installed via the Steam only. 1. Follow the link www.steampowered.com/about/. 2. 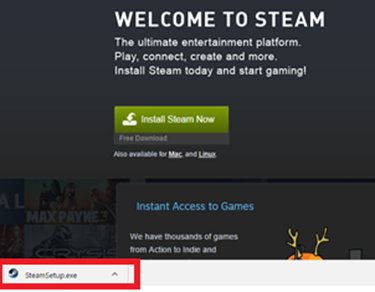 Click Install Steam Now button. After that, the SteamSetup.exe file will be downloaded to your PC. 3. Launch the SteamSetup.exe file. The Steam installation master window opens. 4. You can read all the info in the window if you want. Click the Next button. 5. Accept the license agreement terms and conditions by checking the “I accept the license agreement” box. After that, click Next. 6. Choose the language of your Steam client interface. Click Next. 7. Specify the installation folder for your client. Please, ensure the target partition has enough free space. After that, click on Install screen button. 8. Wait for the installation to complete. Click Finish. If you don’t have a Steam account yet, you need to create it. The account is required for storing your games, communication with the local community, downloading additional content, etc. 1. Open the Steam client. On the first client launch, the system will update it to the current version. You need to wait for the update to complete. 4. Set your valid email address. This email address is required for securing and restoring an access to your account. Click Next. And set secret question in case you will forget password. Click Next. 5. Check the correctness of the info you specified. Click Next. After that, click Finish. 6. You have successfully created a Steam account. You need to confirm your email. Without confirming the email, you will not be able to install protection for the account, restore an access to it, or buy items on Steam. 1. 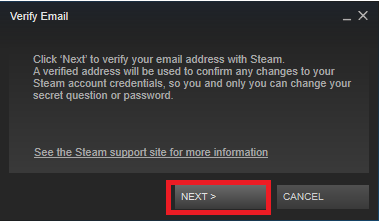 Start the confirmation procedure by clicking Yes in the green field of your Steam account window. 2. Click Next and Finish. 3. Open your mailbox and find the email from Steam containing a request to confirm your email address. Warning: the incoming email from Steam may be automatically redirected to Spam folder due to security settings of your email provider. 4. Open the received mail. 6. You have successfully confirmed your email. 1. In the Steam client go to Store. Type “Counter-Strike: Global Offensive” in Store Search field. Select the game in the right click menu. 2. Scroll down and click ADD TO CART near the Buy Counter-Strike: Global Offensive button on the display. 3. Click PURCHASE FOR MYSELF. 4. Select the payment method. After that, accept the terms and agreements and click Continue. 5. Make the payment using the selected method. 6. Go back to Steam. 7. Enjoy your purchase. You can find the purchased game in Library. Go to Library. Choose Counter-Strike: Global Offensive. Click on the Install blue button on the screen. Set the installation path and installation settings. In the Library select Counter-Strike:Global Offensive. Click the Play blue button. The game settings that you can’t change in the game, but can be configured in this menu. You can specify these parameters entering the Properties and then Set the Launch Parameters item of the menu that appears after your right click on Counter-Strike: Global Offensive. • -language *** - sets the game language. You can choose, for example, English, Russian (with the selected language name instead of asterisks). • +*** - for an automatic command execution on the game launch. For example, exec config.cfg - loading a configuration file to the game, or dev 1 - entering a developer mode (specify the command instead of asterisks). To verify and restore an integrity of the game files you need to go to Library in your Steam client interface and right click on Counter-Strike: Global Offensive. After that, you need to select the Local Files tab and click on Check Cache Integrity. The activation of this menu button initiates an integrity verification for all the game files. Missing files will be downloaded, and restored previous file versions in case of their unauthorized modification. This procedure can help to solve the problem of accidental deletion or modification of any game files, which may cause errors during the game launch or run.